Whether or not you believe that rusty old fable about Marco Polo and pasta - and it's highly dubious given the archaeological evidence that the Etruscans and ancient Romans were avid consumers of the stuff - there's no denying certain culinary parallels where noodles and dumplings are concerned. Mian and spaghetti. Jiao zi and ravioli. Certainly, for the cook, be she and/or the recipe Chinese or Italian, the pleasure of rolling noodles and stuffing dumplings is a constant - a manual and methodical process that's all the more soothing for its labour. And certainly, for me, this pleasure explains my love of making noodles and dumplings, regardless of race, language or religion. Since figuring out how to "inject" soup into a dumpling, the next logical step was to figure out how to make xiao long bao. 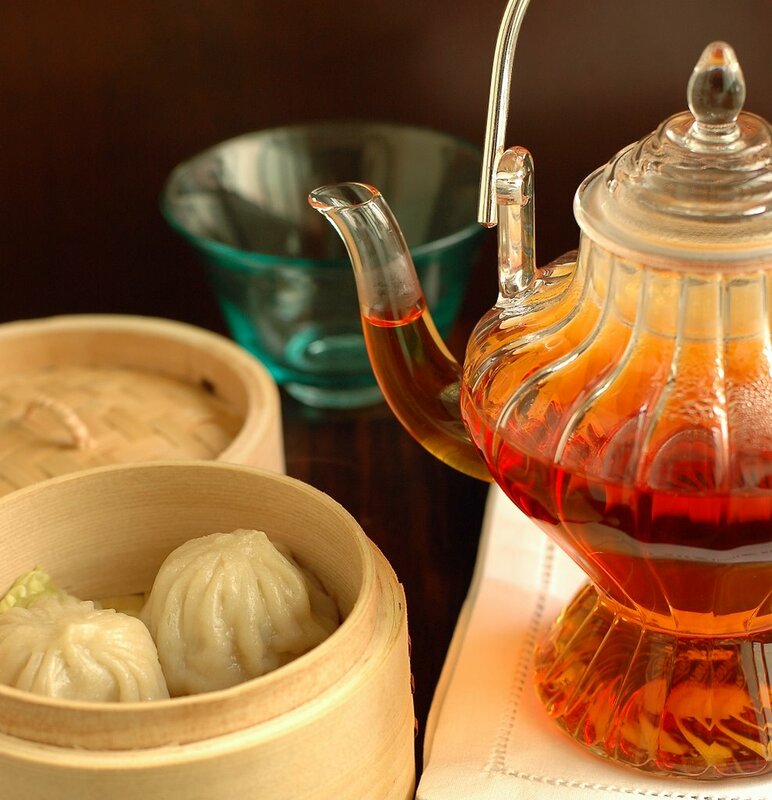 This Shanghainese specialty, named after the small bamboo steamer (xiao long) it's typically served in, is without doubt the dumpling lover's dumpling. W is a bit fixated with it (I attribute this to his Shanghainese grandmother) - I don't know about you, but for me, living with someone who doesn't mind sampling and constructively critiquing the inevitable disasters that occur along the learning curve is a huge motivational factor in the kitchen. 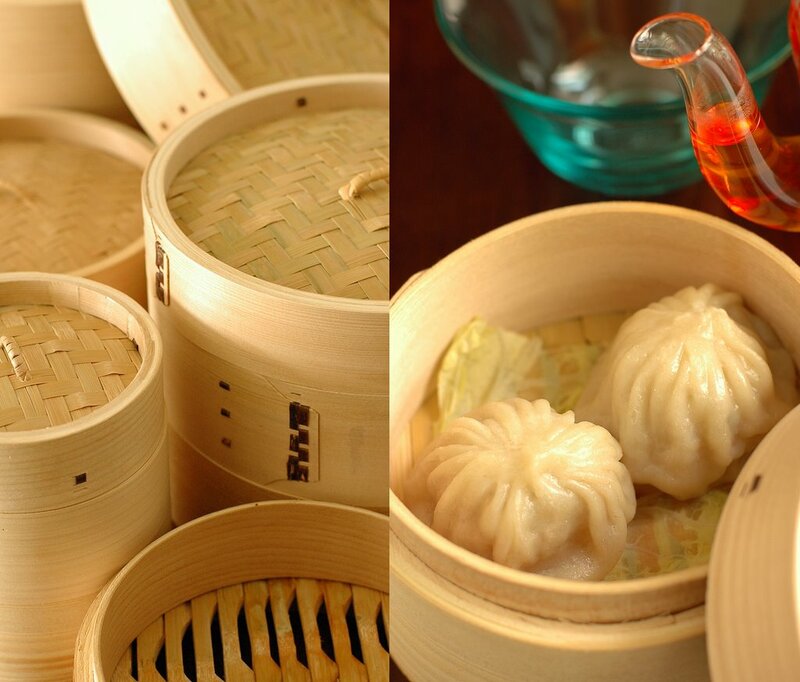 Like a bite-sized version of its Cantonese cousin, kun tong bao (a big dumpling pouch enclosing a soupy stuffing), xiao long bao should be sheathed by a skin that's delicately thin yet resilient enough to encase its steaming, soupy contents. And in my unqualified if unbiased opinion - seeing as I am neither Shanghainese nor Cantonese - the pop-in-your-mouth presentation makes xiao long bao that much more fun to eat. Bite into a well-made specimen and there should be an explosion, a veritable gushing, of intensely flavoured broth in the mouth. Experienced xiao long bao eaters know how to wait for the right moment to eat the dumpling (not when it's scaldingly, tongue-searingly hot off the steamer, but carefully calculated moments after), and how to gracefully slurp the dumpling without wasting one precious drop of broth. Waste aside, broth dribbling down the chin, splattering across the table, and other general mess, are considered exceedingly gauche - consider such the novice xiao long bao eater's joyous learning curve. The secret to this magical dumpling comes down to an extremely humble ingredient. So humble, in fact, that if you ask your friendly neighbourhood butcher very nicely, he's likely to give it away for next to nothing - although if like me, you find the sight of burly men wielding lethally sharp knives intimidating to say the least, you'll likely have bought something of relatively significant value before making your case. 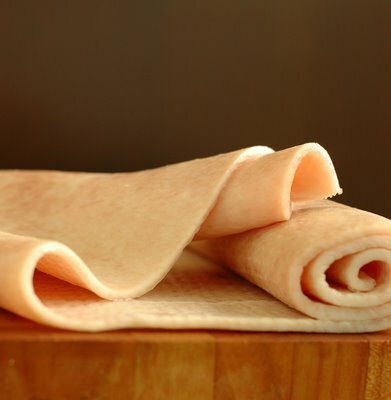 The skin of a pig, or pork rind, is a miraculous thing extremely rich in albumen and collagen, which convert into gelatine when simmered in water. When the water in question is highly flavoured to begin with, ie. a good chicken stock, there you have it - the formula for jelled stock, a naturally set aspic. You'll come across the odd recipe asking for the stock to be set with the refined, pure, colourless, odourless and characterless powder neat from the packet - please, don't go there. Lack of character is exactly what's required for a panna cotta, but for the purposes of xiao long bao, you would be shortchanging yourself in the taste department. Natural gelatine as carrier of natural meat flavour as opposed to mere jellification agent - it's precisely for this quality, for instance, that many traditional French daube recipes often call for the addition of pork rind. The viscosity of a gelatine-rich liquid is related not only to the gelatine content per se but also to temperature. 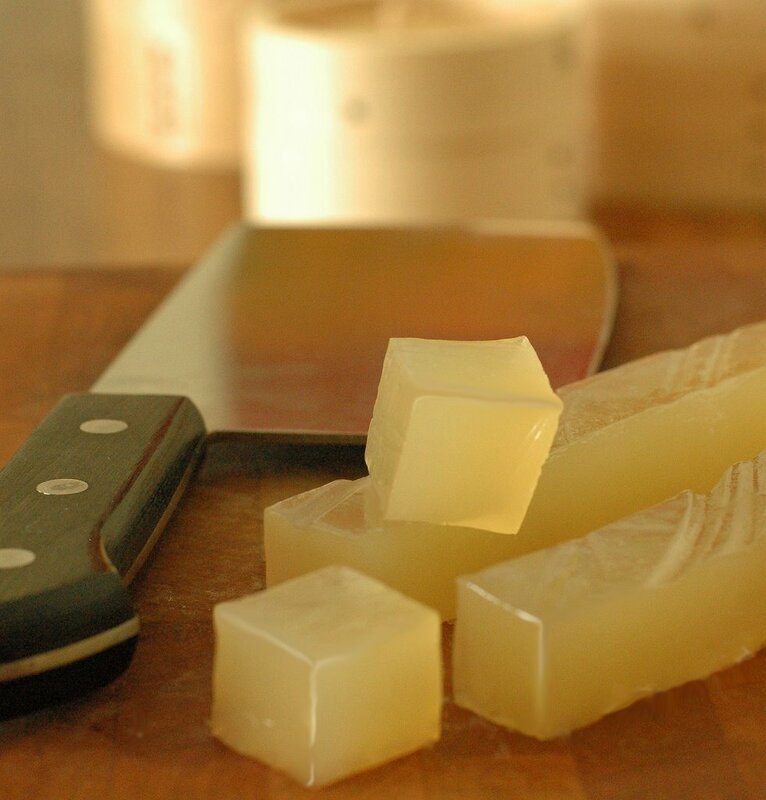 When chilled, the gelatine-rich stock (made by steaming chicken stock with the pieces of pork rind for several hours before straining out the spent rind) will set into a firm jelly. Jelly firm enough for you to turn out and dice into cubes. 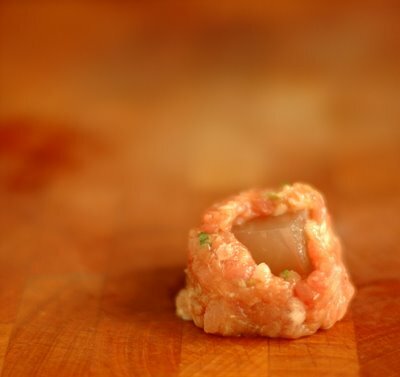 The cubes of jelly are buried like so many nuggets of potential liquid gold in seasoned, fatty pork mince; the jelled stock liquefies when the dumplings are steamed. Thusly, you get soup-in-a-dumpling. Science aside, there's an art to making xiao long bao - a dumpling nimbly crafted by the most expert dim sum chef should boast an amazing number of tidy little pleats. Count 'em - 18 at least, 24 if in good hands. The ability to manipulate the dough is a function of not just skill but the dough itself - pliable enough to be stretched very thinly yet with a sufficiently developed gluten structure to be so worked without tearing. After much fiddling and tweaking and the aforementioned inevitable disasters, I've arrived at a formula that's starting to look right - not a hot water dough (flour plus hot water), not a regular dough (flour plus room temperature water), but both. In other words, first make a hot water dough, separately make a regular dough, than finally combine the two (in the ratio of 1 part hot water dough to 3 parts regular dough) to form a smooth cohesive dough. No recipe yet - it's definitely work in progress. While this latest batch has a sufficiently dramatic soup-spurting-forth effect, and I've worked up to the requisite bare minimum number of pleats thanks to the amateur-friendly dough, I have yet to learn the gesture for making evenly measured and spaced pleats, and for sealing the dumpling at its uppermost point without creating an overly thick and clumsy tip. If and when I do, I will hopefully have a recipe to post. 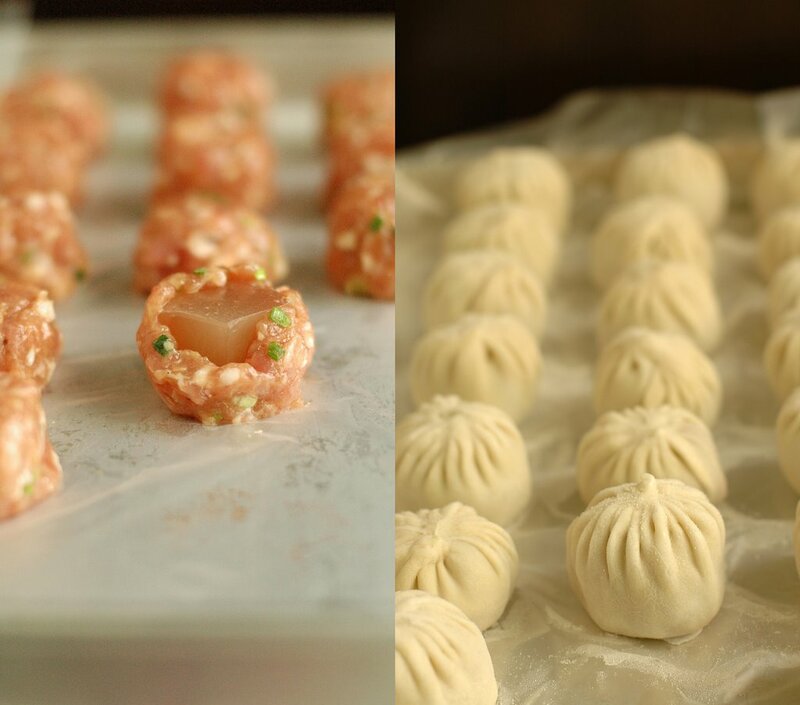 My mom makes amazing Cantonese dumplings and dim sum, but she's hardly ever makes xiao long bao. Thank you for sharing the secret of the jellied stock cube. And your pleats are perfect! I would agree with Mary: Your pleats are perfect and the dumplings magnific!! Those jellied cube are a marvel!! oh my oh my! how clever is jellied soup?! your photography alone is enough to inspire me to drop everything and go see my sell-pork-uncle at the market and buy pork skin. I admire your meticulous efforts in your food prepatations! Love your blog! Thank you for this post! I have been enamored with xiao long bao since my recent trip to Shanghai. Every time I ask, no restaurant will tell me the secret the soup. I figured it must be gelatin. Looking forward to a recipe, though I should practice my rolling and folding skills first. Hi Jocelyn - I'm so happy to see another dumpling post! How in the world did you arrive at that formulation for the dough? What qualities were you looking for in the dough? Your xiao long bao are beautiful and sound delicious (I've never had them before, but I'm really curious to try them now). OMG! I adore Xiao Long Baos! Yours look so pretty. And now, I know the secret of the soup-in-dumpling process. Hi. I love Xiao Long Bao... it was my favorite dish when I was in Singapore and was eating it so often there... Tey are so good! I tried to make them ones... they were good but not as the ones I had in S'pore... I think I missed something. I'd love the recipe even if it resulted in an awkward lumpy top! These look delicious and I can't wait for you to perfect the recipe so we can all share this yumminess! You sure are industrious, my friend. I am awed. Like everyone else, i'm going say, 'quick post the recipe!'. Hey J, I never knew the soup from XLB was from jellied stock made from pork rind! (so many things I don't know!!) I'll be interested to find out how you even out the pleats and the dimple. Will look out for your next post! Oh my thank you thank you. That's such a great use for pork rind. I've only used it to make crackle and puree it for a cassoulet before. These hot water doughs are an interesting thing too, I just saw one for a tart with lard melted in the water. Yum. You know, i would love to be on W's place, testing out your wonderful creations, any day! Look at those pleats ! perfect ! We make something similar with rice flour and a sweet filling. I cannot make these pleats. Do you first pleat and then gather the dough on top ? again your exactness reminds me of someone I worked with.... a baker who walked through the bakery and looked at a sheetpan of croissants, picked it up and dumped it in the garbage....the apprentice was confused? the baker beside him whispered "the rows, they weren't straight"
My, what beautiful musings and kitchen trophies I have been missing from your blog while off in my own world ...your steadfast, repeated efforts always culminate in such wonderous things in the kitchen and I am, as always duly impressed. Bravo on everything you've learned and the prizes you've ended up with! This is soooooooooooooooooooooooooooooooooooooooooooooooooooooooooooooooooooooooooooooooooooooooooooooooooooooooooooooooooooooooo BEAUTIFUL ! wow J, i think you're going to be a perfect xia long bao maker! maybe a stint at din tai fung would help with the perfect recipe, eh? Your dumplings are far more beautful than any I've ever managed to make. Please keep us posted on your techniques and results. Beautiful. Great site and wonderful instructions-- I need to make these...and soon! I love those little juicy dumplings! They are so delicious. Can't wait to try them on my own, though those pleats look pretty intimidating. Looks like you did a great job. wow! new fan of your blog, especially with this post.. it's so great to see the process along with the finished result. beautiful pictures. Love your blog! There is a recipe for these in the Saveur archives that parallels your ingredients pretty closely. I'm about to embark on the adventure of creating these and might be skeptical of a recipe from any mag other than Saveur, which I have found to be extremely dependable at publishing authentic recipes. how lucky am I to have stumbled upon your blog with such awesome tips on making these delicious dumplings...did you ever get to master the recipe? I've been trying to find a recipe for these for a long time. I'm captivated by Xiao Long Bao ever since I saw the episode of Anthony Bourdain in Shanghai. But I've noticed that there aren't that many recipes available, and I cannot even begin to find one for Kun Tong Bao... sigh. You cover it all so nicely here, I can only hope that you'll be able to put up a recipe sometime... maybe. As soon as a recipe is done I'm jumping right into it!